As seen in the last post “Bluestem Kennels in the Omaha World-Herald”, Cordelia, Sam and I had a great time at the photo shoot. Cordelia and Sam were on the front page of the Friday, January 28th paper and also featured in an online video and slideshow. We were the only Wirehaired Pointing Griffon entry in the Friday afternoon Bird Dog Parade. Visiting with local Nebraska Game and Parks personality, Greg Wagner, was a fun part of the day. He mentioned the possibility of having us on his KFAB radio show to talk dogs at some point in the future. Saturday afternoon turned out to be quite interesting for me, as I ended up helping to lead a seminar that I attended. The 1 PM “Picking your puppy and the First Six Months” seminar was quite full and by 1:15 PM, there was still no presenter. A fellow breeder/trainer and I got up in front of the audience and freestyled the seminar, sharing the wealth of what we know on the subject. 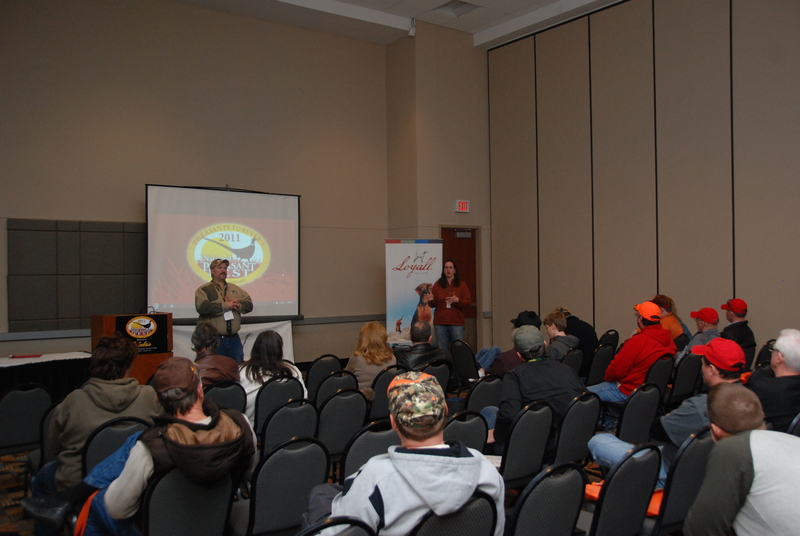 Thank you to Pheasants Forever photographer Jim Cooper for the use of the photo. 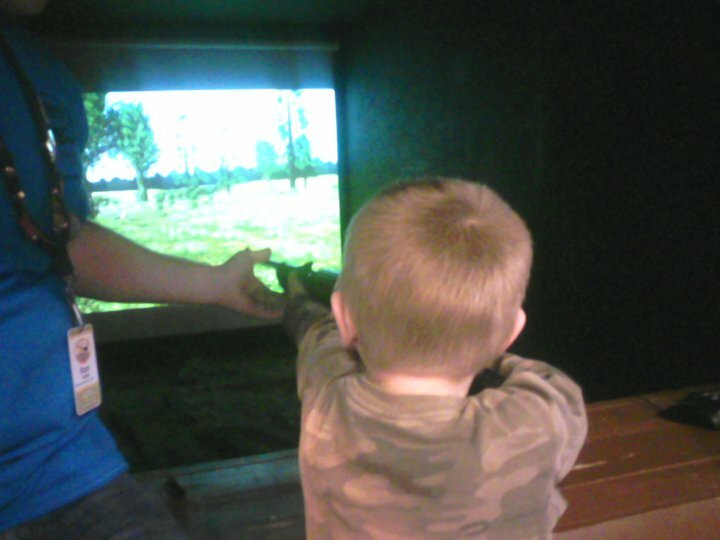 My children spent Saturday afternoon at Rudy’s Youth Village of Pheasant Fest, where we met some inspirational teenagers, the Illinois Pioneer Chapter #069 “Young Guns”. They raised $6000 for a virtual shooting gallery had it trailered all the way to Omaha for the young people to enjoy. My son, Conrad, couldn’t get enough of it! Charles and I had a great time at the Saturday evening banquet visiting with the members of the Auglaize County, Ohio Pheasants Forever chapter and one of their state wildlife biologists. It was interesting to learn that the pheasant population in Ohio has been decimated to the point where the state game and fish department has a pheasant stocking program. I didn’t realize until attending Pheasant Fest that promoting stocking pheasants in Nebraska is seen as nearly rebellious to the habitat cause. The latest Focus on Pheasant report was sent to me by Nebraska Game and Parks following my post “Focus on Pheasant needs to readjust their sights”. Once I get a chance to read their report, I’ll be revisiting this topic will a full post in the near future. We closed out our visit to Pheasant Fest on Sunday by attending Pheasants Forever Field Coordinator Pete Berthelsen’s talk on creating quail habitat on his 160 acres near Elba, Nebraska. It was amazing to see how quickly habitat adjustments can restore bird populations. In a matter of a few years, he went from one covey of quail to fifteen coveys! The weekend was a complete success and really fired us up to increase our involvement in Pheasants Forever, habitat restoration and sharing our love of not only the Wirehaired Pointing Griffon breed, but raising, training and hunting versatile dogs.